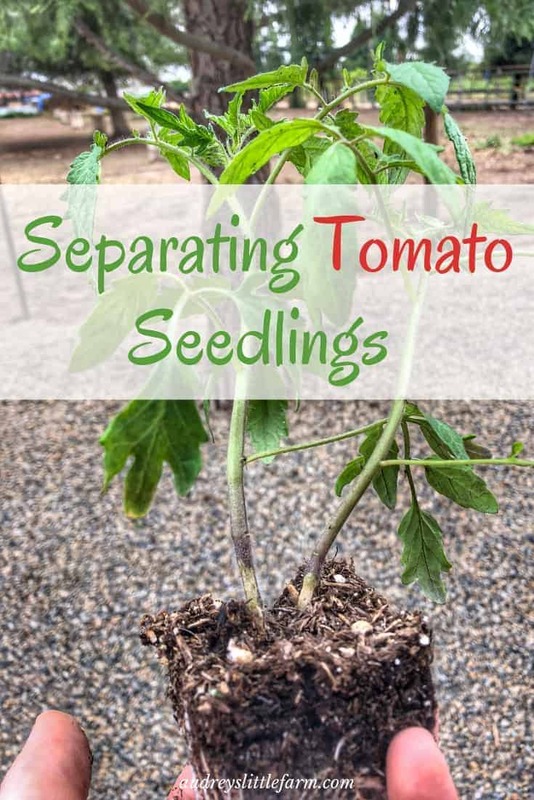 Were you fortunate enough that all of your tomato seeds sprouted but now you’re wondering how to separate all of the tomato seedlings, or if you should at all? The answer is yes! It has been a few years since I started my own tomatoes from seed. I was busy and by the time I wanted to start my own seeds it was too far into the growing season. So the last couple years I’ve just been buying tomato transplants. And while there is nothing wrong with that, I love starting my plants by seed. Doing so also gives you so many more options. So thankfully this year I did everything on time and got all of my seeds started. I ordered my tomato seeds from Seed Savers Exchange online and got about 6 different heirloom varieties. Then when I started planting them all in pots I figured I’d plant a 6 pack of each variety. Then of course I assumed not every seed would germinate so I planted 2 to 3 seeds in each section. Well… I am pretty positive that every seed germinated so I had 18 of every tomato variety! Lets just say I’m going to have an official tomato farm this year! Initially I figured I’d just snip off the extra seedlings and let the strongest plant grow but they all seemed to be growing great. So I decided I might as well separate them and have extra plants. I already knew that tomato plant root systems don’t mind being disturbed so it’d be okay to gently separate them. Unlike other plants like squash that prefer to not have their roots messed with. So why not keep all the plants that you’ve already started right! 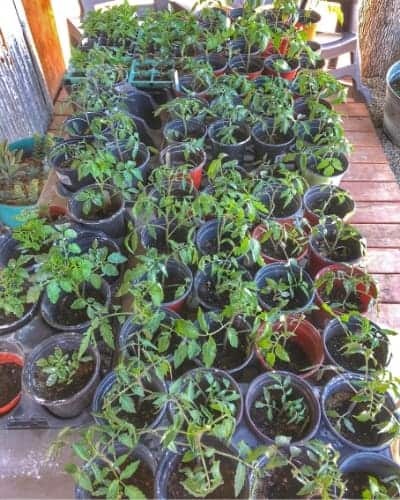 Even if you can’t plant them all you could give them away to friends and family, or keep them growing in pots as back up in case your other tomato plants die. I separated my tomato seedlings when they were about a month and half old. 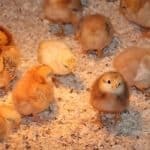 At this point they were plenty big enough but should have probably been separated sooner. You want to give your tomatoes plenty of time to grow in some healthy roots before you pull them apart. So once your plants are about 4-6 inches tall and have their second set of leaves you’re good to go. First, gently remove the tomato plants from the pot they are growing in. Then depending on how many seedlings you have growing, gently pull each plant apart at the roots. Next, you should repot each of these seedlings into their own larger container. 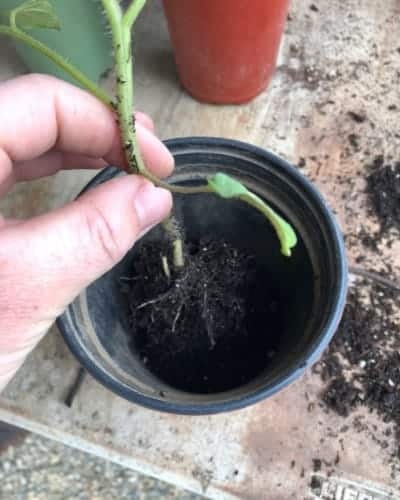 I wouldn’t recommend planting the separated seedlings straight into the ground, it’s better that they get repotted and have some time to grow a stronger set of roots. Tomatoes are pretty amazing plants and will grow roots off every part of the stem buried in the soil. 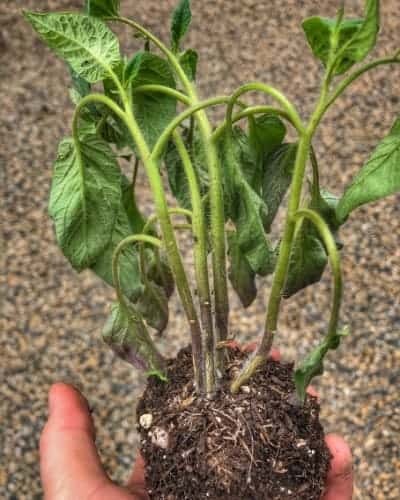 So getting repotted into a larger pot before transplanting gives them more time to establish extra roots for successful transplanting in the garden. After you have separated each seedling, place it in a larger, deeper pot. Then cover them with soil all the way up until just below the first set of leaves. The reason you can plant them so deep is because roots will grow from all areas of the stem covered. The more stem covered, the stronger the root system it will get. Keep your seedling roots moist while repotting. You should water before repotting and immediately after. 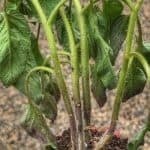 After you have repotted them into larger pots give them a fertilizer such as Vitamin B-1, which will help with transplant shock and root growth. Then keep your tomato starts in an area out of full direct sun and harsh weather such as wind and rain, and keep them moist so their roots do not dry out. The less problems they are faced with initially, the stronger they will grow in their pots. After you have repotted your seedlings let them grow to be about 8-12 inches tall and then transplant them out into the garden. Although, just be sure that all extreme weather has passed before you put them out in the garden. 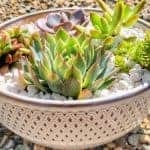 Then, just like how you planted them deep when you repotted them, burry the stem up to the first set of leaves when you plant them in the ground. This will ensure that your tomato plants grow great root systems out in the garden too! 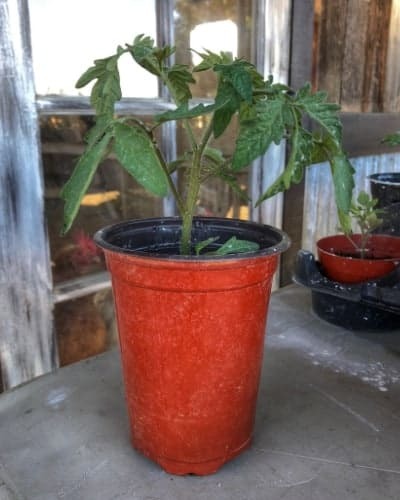 If you’ve never grown your tomato plants from seed and want to learn how, I have a great article that has all of the steps for the entire process. Just click on this post How to Grow Tomatoes in Pots from Seed, and it’l give you all the information you need! Now those are just a few of my favorite ways to use fresh tomatoes. There are so many more ways! But if you’ve never made your own homemade spaghetti sauce it is a must! And… you need ALOT of tomatoes especially for making canned spaghetti sauce. A couple years ago I made homemade spaghetti sauce and spent 3 hours stirring, thinking I was going to have sooo much sauce. And it only made 3 1/2 jars! I was so sad and disappointed, but learned my lesson that you really need a ton of tomatoes to make a large batch. So this year I am so excited to have my own little/big tomato farm so I can make all the wonderful things like spaghetti sauce!